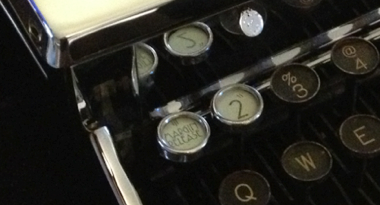 Just appreciating my typewriter a little. Hmmm… Redundant phrasing… eat you heart out. I think I need some caffeine. I mean really… who writes without a caffeine hit next to them? And the writer seems to have a few issues too…. Talk about questionable grammar. 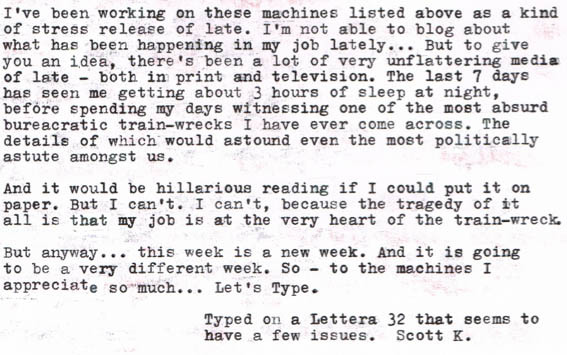 February 10, 2013 in 32, ITAM, lettera, Olivetti, typecast, typewriter. ← Throwing ink onto a page – hello ITAM! Looks like some interesting posts ahead, Scott. Don't stress. We ain't going anywhere. I look forward to your posts. If I posted what I plan to write I know Murphy and his law would pay me a visit and my most of plans would turn me into a lier. I hope you do not get too stressed about your job. Stress does not change anything nor make anything better. Looks like you're doing something very clever and stylish to that keyboard. I will be reading when you post. Oh, with the exception of the Type-in. I've got most of these projects at a finishing stage. I know what you mean though, and I certainly have suffered the same fate on a few projects. Plenty of interesting things to talk about yet! Thanks Mr T.
Oh, I certainly think you'll love the outcome on this machine Richard! It is right up your alley. That certainly sounds promising. Is the Valentine ready for a glorious comeback on its nameday? Ha ha ha. 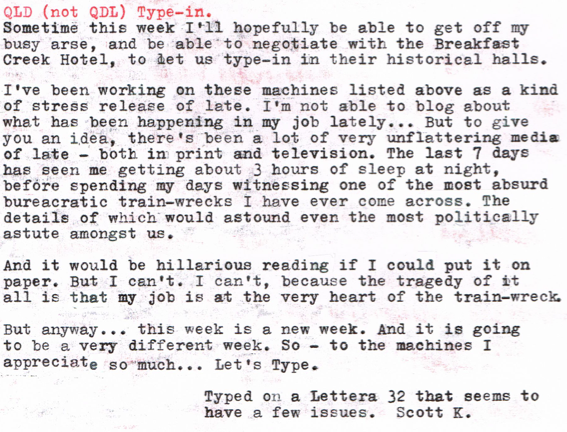 You, and your Olivetti loving ways! You know… I think it is! Very nice key recapping there. beautiful font! Just wait till you see the end result!